When my husband and I went to Blockbuster to rent The Talented Mr. Ripley ﻿(I had to see it after all the comments you left on my review of the novel! ), this film caught my eye. First, that it was Japanese. Secondly, that it won the Academy Award for the Best Foreign Language Film. It is easily the best film I’ve seen all year. On a theme that’s dear to my heart, departing, we have a thousand variations: departing when a father abandons his wife and son, departing when one moves from one’s dream job to any job one can find, departing when we leave this earth. I cannot begin to tell you how lovely and powerful this film is. I recommend it with all my heart. This sounds like it has the right degree of spirituality & quirkiness to appeal, wonder if it started as a book & what that is like?, might be worth checking out . I'm pleased to hear your recommendation. It caught my eye on Apple TV last night, but the trailer did not do its justice. I shall watch it next weekend. Thanks. Parrish Lantern, not might be worth checking out…is definitely worth it! ;)Anthony, I don't know what Apple TV is, but it's interesting that you saw the trailer. I hope you like it as much as I did when you watch it next weekend. It's a movie I won't soon forget, and I'm not readily drawn to death as a topic. 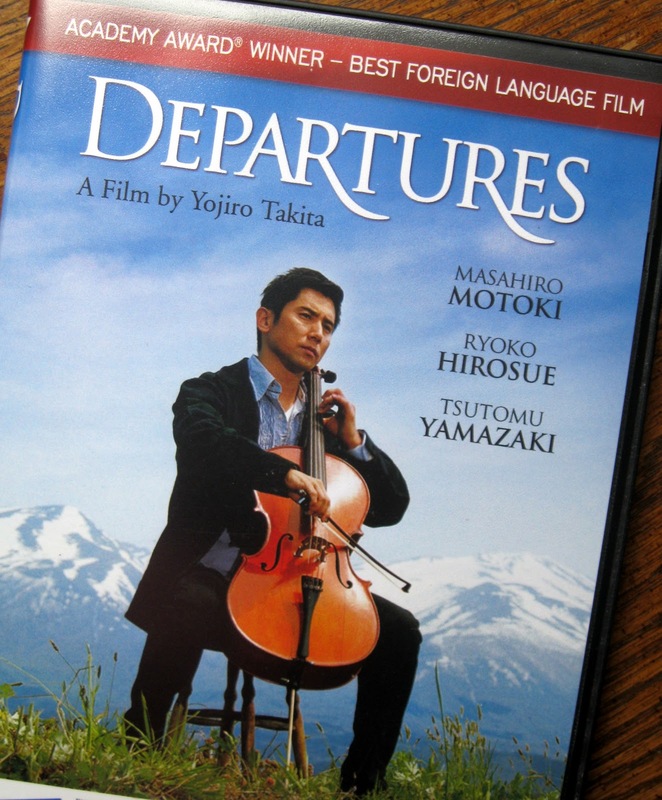 However, when I look back at the film, death was handled with such respect and tenderness it was almost beautiful, and the other "departures" in the film were very significant as well. I will add this to my list of Japanese films to watch, Bellezza. I had not heard of this one. Will have to look for it–thank you for the recommendation! I LOVED this movie when I saw it last year at the theater where I work. I play the cello a little bit, so that was my initial draw (on top of the great premise). I've been waiting for it to be released on DVD in the states. I'll have to locate a copy. So glad you found it and liked it! This sounds like a wonderful movie, Bellezza! Thanks for writing about it! I will add it to my 'To Be Seen' list. Do you read Manga comics? Have you heard of a series called 'Nodame Cantabile'? The main characters in the story are teenagers, but it also has a classical music background and it is beautiful. Thank you for the recommendation! I will add this one to my must see list. *putting it on my netflix list right now* thanks for the recommendation! I LOVED this movie so so much too.. I fell in love with the music, the meaning I found in each of the characters and who and what they represented. Glad that you loved it too. It's one of those movies that I love so much, I've not stopped recommending it to people I know. I watched this last year and loved it. I especially liked the quiet, understated tone of the film which gave it depth. The acting was amazing, wasn't it? Hi, M, trying to learn to blog/blog read while family watches tv. oh, there's so much here to look at and to read and once again (do I always say this?) it's been ages since I've blogged around! but your place (here) looks awesome – you've made is so artful, attractive, aesthetic and then there's always your wonderful entries on books and herein, movies. thanks for this. thanks for keeping us connected to places we might not always otherwise go! Yes, I agree this is a fascinating movie not only about the ritual towards the departed, but also a tribute to those who remain living… from a Japanese POV. I must say though, at times it makes me feel uncomfortable due to the fact that I have to take care of two elderly parents. But I've appreciated its honesty and the occasional humorous rendering. Again, this is something very unique, cinematically and culturally… and very human. Oh I have to find this film! Thank you! This was a gorgeous film – my library bought it and I watched it a while ago. Really beautifully done. I was very moved by it. I've been wondering about this one, I'm happy to hear that it is such a lovely film. I have it on my Netflix queue.